Germany's Germania issues of 1900-1922 can, at first glance, be a real pain to identify. To help in this regard, I've put together a little tool that allows you to filter the Germania issues by face value, watermark, and type, to narrow down the potential catalog numbers. (1) A handful of the photos are representatives, not actuals -- meaning, if two catalog numbers (say, #68 and #83) are identical except for the watermark, they may have the same photo (in this case, #68). I have photos of most of the actual issues, but they're on a boat to the Azores at the moment, so I had to make do with what's available on the Internet. (2) I'm working on adding the larger issues, and some more specialized items. There are a lot of minor variations, and I may eventually add them all, but for now it's just the basics to get you in the ballpark. 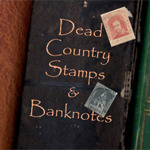 PostmasterGS, thanks for the link to your Germania Identification page. That is a great handy reference guide. I would like you to add varieties such as the Vineta Provisional. Vineta Provisional added, MikeC99. There are so many minor variations of these issues it makes it a challenge to incorporate them all. I'll probably try to include peace/war printings, and a guide to differentiating them. I doubt I'll try for color variations, as there's no way I could get good photos for all the varieties. This is great. I look forward to using this. Since yours are 25:17 perf, they can only be wartime printings. I suspected that from the perf, but the color and the print quality are very different. Was there this much variation in print runs? 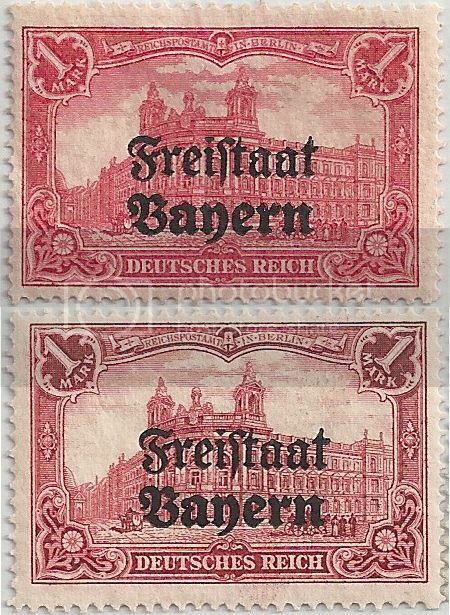 My old Michel lists your Freistaat Bayern overprinted stamp as having two colors, carmine red and red, but doesn't list separate numbers. PostmasterGS, I just checked you website and I can't find the Germania identification tool that you were developing in 2014. Is it still there and I missed it or did you remove it? Sorry about that. I rearranged some stuff a while back, and it broke the link. I've updated the link in the original post at the top of this thread. I recently finished adding the remainder of the major varieties of Germania issues to the Germania Identification Aid. I also did my best to add Scott numbers, though I'm not 100% sure they're all accurate, as some can be difficult to match to Michel.